The theme for World Environment Day (WED) 2017 was ‘Connecting People to Nature’. This year each person was encouraged to get out and enjoy our environment. 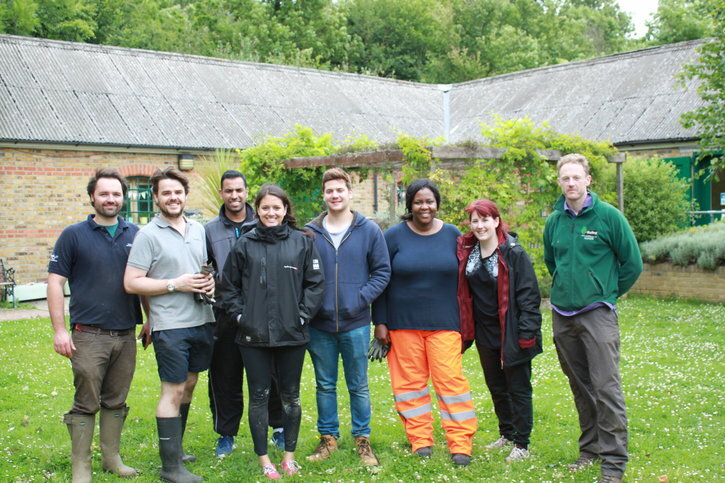 To celebrate WED 2017, a number of employees from the Crossrail West Stations (CWS) team carried out a Stand Out Make a Difference Day at Horsenden Farm in Perivale, Greenford. The site comprises of meadows, wetland and woodland habitat. It is bordered by a small patch of grassland, wildflower meadows, hedgerows, ponds, reed beds and lagoons which offer a peaceful haven for wildlife and visitors. The seven strong team of volunteers spent the first half of the day sieving and distributing approximately 10 tonnes of topsoil. The topsoil will be used in the vegetable planters which was donated by CWS. The planters were made from reused plastic drainage pipes. Some timber sleepers, netting and roof felt was also donated to the farm. Other activities that followed include weeding, mowing the lawn around an orchard of apple trees, tidying the green house and general stores and making a compost bed. The team also had the opportunity to connect to the natural environment by meeting the chickens and pigs on the farm. It was a hard day’s work but the satisfaction of knowing they had helped the farm made it worthwhile. Why don’t you take up the challenge and connect to nature by doing something exciting and beneficial for the environment!